Anyway, these are the biggies. They’re all out beyond Neptune’s orbit. They’re all large enough to be kinda planetlike in some ways — they’re in hydrostatic equilibrium (meaning they get mostly round and stay mostly round). They’re not themselves satellites. But they aren’t large enough to have “cleared their neighboring region of planetesimals,” i.e., to have slurped up all other orbiting bodies unto themselves. 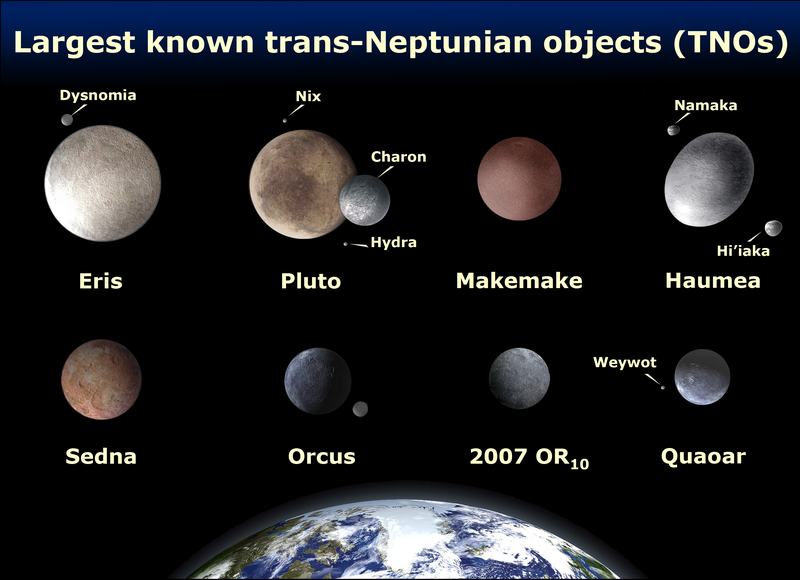 Which means, according to the International Astronomical Union’s Resolution 5A of 2006, they aren’t planets. 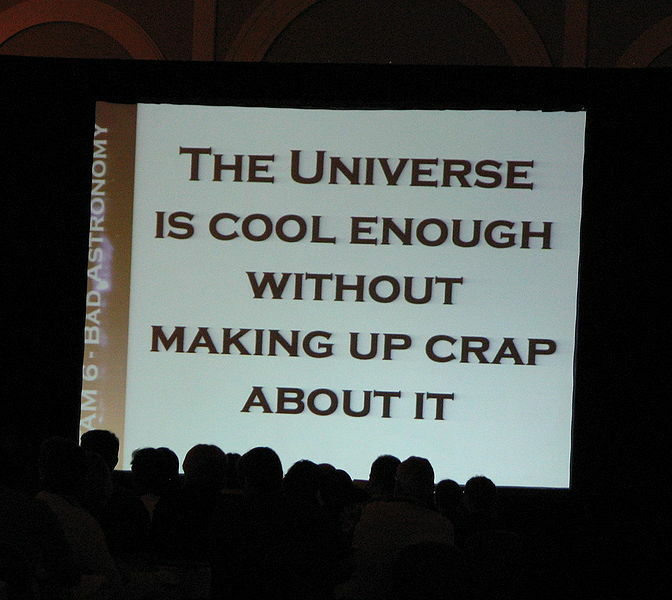 And what would Clyde Tombaugh have thought? My impression of Clyde in his later life is of a man at peace with himself. Every picture I’ve seen of him shows him beaming, and surely he was much beloved. 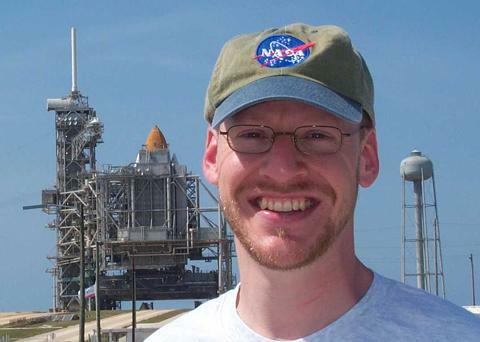 Though he defended Pluto’s planetary status when it first was questioned in the 1990s, I believe he also recognized his discovery of Pluto as being something of a happy accident. And today, I can imagine him arguing that we welcome the planetary status of such substantial bodies as Eris, Haumea, Makemake, Orcus, Quaoar, and so on. The universe had made room for him in such an unlikely fashion, after all – I believe he’d have wanted us to return the favor. So on Clyde’s behalf, let the IAU know we want Pluto back! 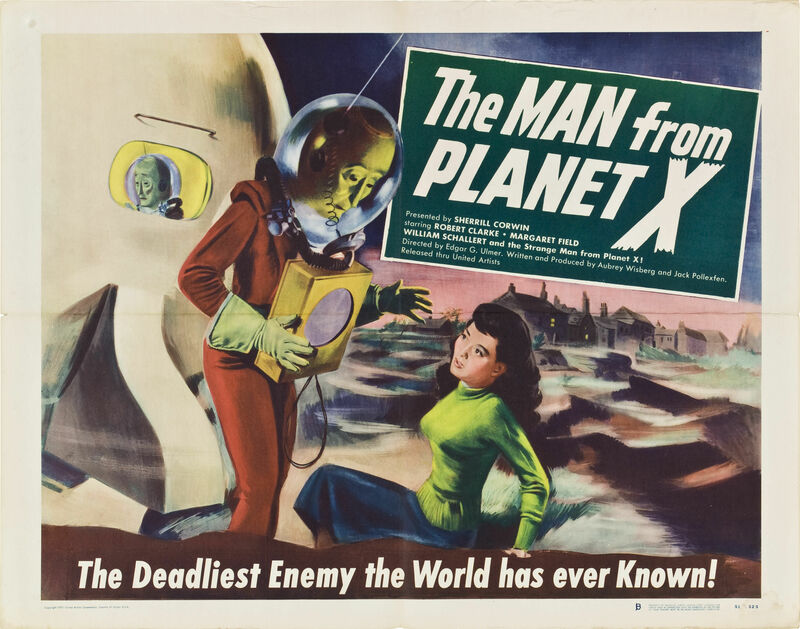 The Man from Planet X – (not) a J.J. Abrams production. 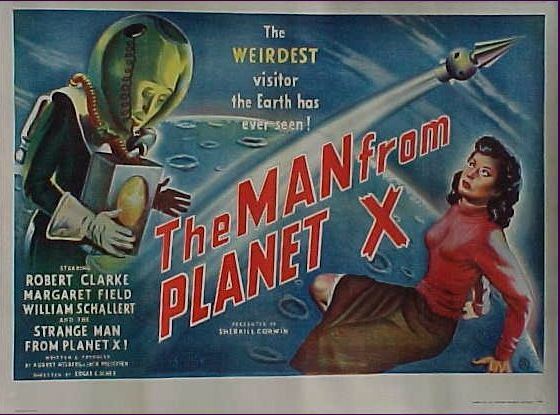 So, okay, when you fly in from Planet X and land outside town in 1951, what you need is 1) a bubble helmet 2) pajamas 3) a GIANT voice translator and 4) comfy green gardening gloves. Oh, also, MAKE SURE YOU LEAVE GRANDMA IN THE SHIP! She tends to wander. A horrible monstrous creature with a head as big as two men put together... a skin with the shine of a new shilling...eyes no better than a dead codfish! 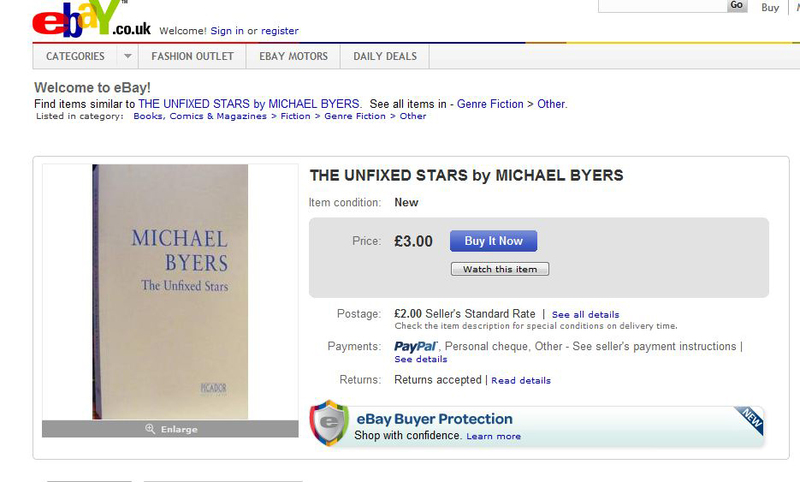 This one is even more hilariously subliminal. Check out that “rocket”! Whoopsie! 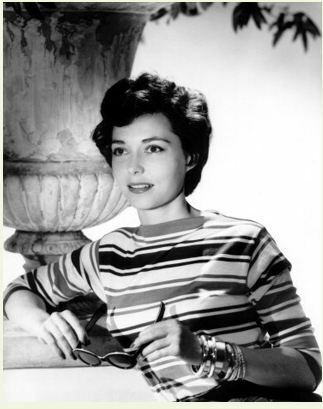 And guess who that is – yes, it’s Margaret Field, mother of Sally Field! Looks like The Strange Man from Planet X likes her…he really really likes her! 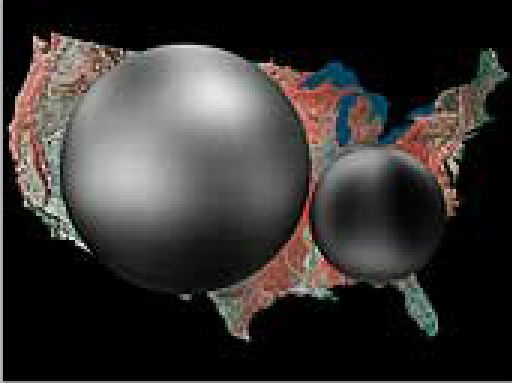 How big is Pluto exactly? Pluto is about 1446 miles in diameter – the distance from Flagstaff, Arizona to the Canadian border near Minot, North Dakota. Pluto’s moon, Charon, is about 750 miles in diameter. I didn’t know until very recently about the kooky theories surrounding Planet X — not in 1930, I mean, but right now, today. While I won’t link to any of the real loonies directly, a quick read of the Wikipedia entry on the Niburu collision should give you a sense of what kinds of lunacy people are capable of committing to. (In sum, the belief involves a NASA conspiracy to cover up the existence of a giant 10th planet on a collision course with Earth.) The most strenuous advocates of this belief appear to be either deeply delusional — I mean, mentally ill — or outright charlatans. Charlatanism is entertaining, but untreated mental illness ain’t. Happily, the forces of good are hard at work. The excellent Phil Plait, of Bad Astronomy fame, is on the case against the Planet X conspiracists. Of course, demonstrating logical fallacies, misconceptions, misunderstandings, and the like to a group of conspiracy theorists is sort of like describing soccer to your cats: they might appear to be listening, but their behavior never seems to change. The loveliness of the Lab Lit List. 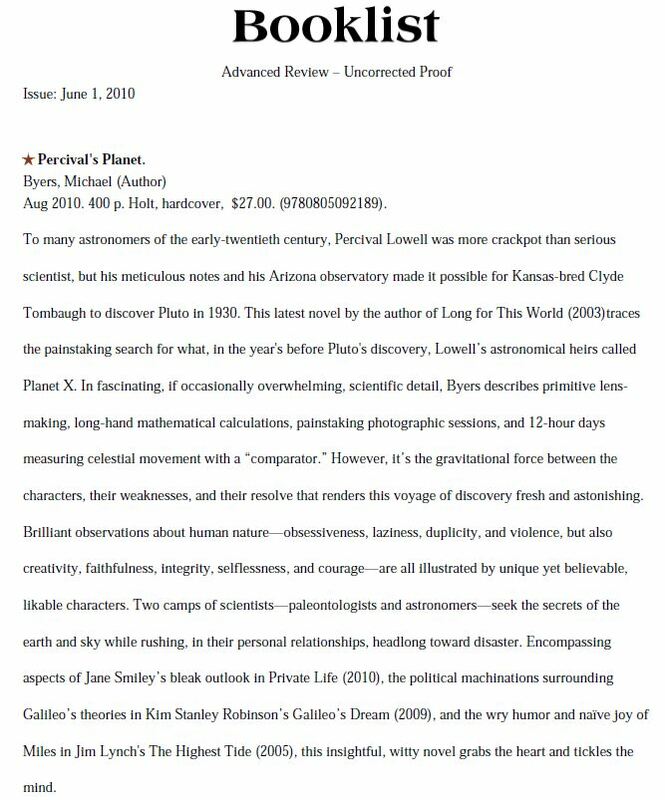 Percival’s Planet gets a nice mention on Lab Lit (as very much opposed to Lad Lit) — a list of novels that feature scientists as central characters. Thanks to Dr. Jennifer Rohn, founder of Lab Lit and author of the much-praised novel Experimental Heart, for including the book! 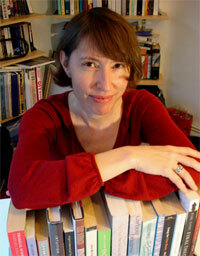 Dr. Jennifer Rohn is a cell biologist at University College London and founder and editor of LabLit.com. This kind of thing means a lot to me. I like to know that I haven’t misrepresented the scientific endeavor entirely. 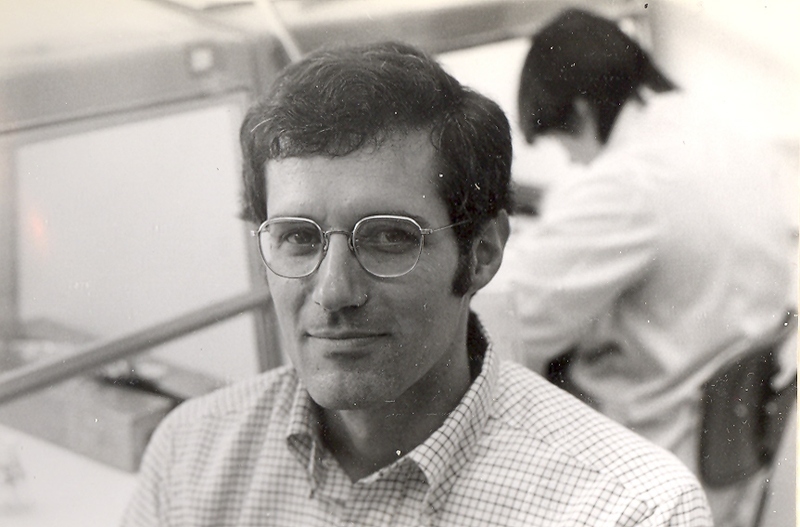 My father, Peter Byers, is a medical geneticist at the University of Washington; my first novel takes place (in large measure) in a genetics laboratory. In high school I worked occasional afternoons in my father’s lab, responding to reprint requests or photocopying articles from the depths of the library – this was in the dark ages before the Internet – so I was able to witness the workings of his lab from up close, and to observe (in the idle, uncomprehending manner of a teenage nonscientist) the bland make-do surface of daily laboratory life, the not-so-new-any-longer machines, the labels hastily written in black marker on blue tape, the coffeemaker always on and smelling sort of bad — and I loved it all, the long corridors of similar labs down the E wing of the Health Sciences building, the sense that every laboratory interconnected with others around the country and around the world, and the sense that all that effort had been organized by good people in the service of research that might, one day, end a certain variety of human suffering. I knew I wanted to write about that sort of work, and though it took me a while to figure out how much it meant to me exactly, the impressive daily enterprise that science is, in full, has always struck me as one of the great human things in the world to be optimistic about. Done well and completely, science is a communal effort, performed in the service of understanding the universe more fully, with an often decades-long time scale. If our species ends up making it on Earth in the long run, it’ll be thanks to those folks who have been undertaking this work for so long. C’mon guys! I don’t want to move to Mars! I just finished planting my tomatoes. Sometimes I think it’d be cool if there were a GPS chip installed in every copy of a book — not just so I could track people down (although that would be interesting and entertaining), but so I could google-map where the dozens of copies were and see where their merry travels had taken them. …and also, naturally, “charity shops”! …with another star! You never know what the hell people are going to say about a book once it’s out in the world, so it’s awfully nice to have some pleasing things said right off the bat. It’s especially cool to be compared to Kim Stanley Robinson, a sci-fi dude who is one of my heroes (he wrote Red Mars, which in fact was the favorite book of a character in my previous novel). And Jane Smiley! (I haven’t read Private Life, but I happen to be reading the excellent Ten Days in the Hills right now.) Tickles the mind! Insightful! Witty! Occasionally overwhelming! $27.00! Whew! I think need to go hose off a little.